The provincial government of Samar will jumpstart its tourism promotion program, which will focus first on four towns of the province. Listed as priority are Marabut, Basey, Sta Rita and Paranas tagged as market-ready for tourists. Marabut town in Samar province is famous for its natural rock formation and beaches. 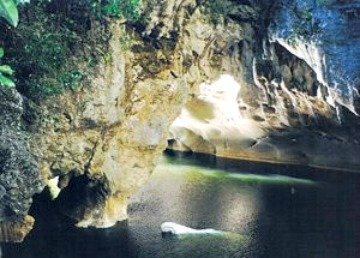 The nearby town of Basey town is known for the Sohoton Natural Bridge National Park, caves, 17th century Church, Buscada and Mt. Carmel Chapel, Jinamoc Island, the Guintolian Tower, Balintawak Falls and the Golden River. In Paranas town, the Ulot River Extreme Boat Ride has been drawing tourists. Whereas, the town of Sta Rita, boosts the magnificent view of San Juanico Bridge and San Juanico Strait, the narrowest strait in the world. The area is being promoted by the provincial government as organic farming hub in Samar. “We are already half-way in our campaign and these towns are already tourism ready. It would be hard if we just let go now of this program when we are already near the end of our campaign,” Governor Tan-de los Santos said. If the result is positive, the provincial government will replicate the program in other towns in the province with potential for eco-tourism development. The lady governor stressed during the meeting that the provincial government will only start the promotion drive and eventually the private sector such as the ABS-CBN Foundation will ensure the sustainability. Toto Cinco, a consultant of the Department of Tourism (DOT) Eastern Visayas suggested during the meeting to target domestic tourists first in the campaign considering that 70 percent of visitors in the region are locals. Representative from business group said they will encourage local businessmen to invest in tourism relation facilities as it will not only generate income for them, but also provide livelihood opportunities to the community. The Armed Forces of the Philippines and the Philippine National Police assured that tourists will be given proper security when they visit destinations in four towns that are being promoted by the provincial government. Samar police provincial director Nolasco Bathan said they will deploy tourist police to four towns and will activate the barangay law enforcement team to boost security. The army will also assign personnel near the jump-off point of tourist especially in Paranas town for security and apprehend logs and lumber illegally cut in the areas covered by Samar Island National Park. On Feb. 21, the Samar governor and DOT regional director Karina Rosa Tiopes will conduct a site inspection in Ulot river. Another meeting will be held by the Samar tourism council on Feb. 23 where towns tagged as priority areas are expected to present their tour packages to the provincial government. The local government unit in this city identified tourism development as one of its priorities for 2015. Mayor Ronaldo Aquino said that concreting of access road from Amampacang to Lungsob villages is now underway to ensure that Mapaso Hot Spring is accessible. Mapaso Hot Spring, located in Oquendo District is among the city’s tourist sites being developed since 2013. The mayor added that the city is likewise implementing a project for the access road leading to Mawacat slide in Mawacat village. This tourism site has a natural spoon-like formation, which inclined about 45 degrees and stretching a length of about 50 meters. Water flows along the giant and from the top one can slide through the mossy lane to the cool inviting pool below. Aquino told reporters that the development of Malajog Beach is on progress. The local government allocated an additional Php10 million pesos for the completion of the project. Component of the project is to put-up a zip-line as an added tourist attraction. According to the city mayor, the owner of the islet fronting the beach has agreed to negotiate with them to use the place for tourism development. Malajog Beach is one of the tourist haven in Samar province with its grayish sand and cold blue waters with towering rocks. Meanwhile, the Php50 million Bangon Falls access road development project in Tinaplacan village will be implemented this year by the Department of Public Works and Highways (DPWH). The city government is also implementing projects to further beautify the city proper. Within the year, the development project for Nijaga Park will be launched. Aquino stressed the need to make the city’s center attractive to both tourists and investors. Meanwhile, the city tourism and information office said that hotels and lodging houses reported a tourist arrival of 93,826 in Calbayog in 2014, higher than the 61,092 visitors a year ago.